The Forbidden Kingdom follows the tradition set by many other fantasy adventures: character from the modern day world transports to a different time and place and must carry out a duty before returning home. Stories like this have practically existed since cinema began and even longer in literature (The Wizard of Oz applies to both). There have even been ones all too similar to The Forbidden Kingdom in terms of its specific context. Wasn't Teenage Mutant Ninja Turtles 3 about the Turtles time traveling to feudal Japan so they could stop an evil warlord? Never mind Turtles 3. The Forbidden Kingdom is actually a good movie with the right balance of action, story and likable characters that make for an entertaining two hours. Some of its magic must come from our knowledge going in that it's the first time two legendary martial artists of the cinema - Jackie Chan and Jet Li - have appeared on-screen together. In their first shared scene, Chan warns Li, "Somebody could get hurt," which is like a wink at the audience that lets us know we're in for a treat. Credit to director Rob Minkoff for letting Chan and Li share the screen rather than compete for it. Minkoff and his team know fans of both talents will care more about experiencing a fun, exciting action picture than seeing the two simply fight. Their dialogue and interaction ends up being high-spirited and sort of jolly. The plot: Jason (Michael Angarano) is an American teenager living in south Boston. He's obsessed with kung fu movies and frequents a Chinese pawnshop owned by Hop (Jackie Chan), an old, graying man who tells Jason about a sacred staff that "must be returned to its rightful owner." That rightful owner is the kooky and rebellious Monkey King (Jet Li), who was turned to stone by the evil Jade Warlord (Collin Chou) hundreds of years ago in China. One day, Jason is bullied by a Boston street gang into stealing from Hop's store. When the old man is shot, Jason runs off with the staff, which sends him back to ancient China. The actual time where he ends up is never made clear but lucky for Jason the people he needs to communicate with all speak English. He befriends Lu Yan (also Chan), a kung fu master who's sort of an homage to Chan's own Drunken Master character (Lu's immortality depends on his drinking plenty of wine). 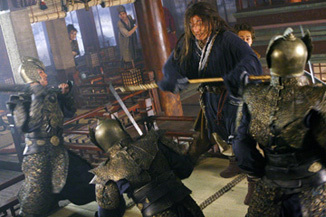 Jason and Lu are joined by Golden Sparrow (Yifei Lu), an orphaned female warrior seeking revenge against the warlord for killing her parents, and Silent Monk (also Li), who has his own allegiance to the Monkey King.